The video below focuses on the Guzman’s place in the Oak Creek Estados complex and on areas just a few minutes from it. Click on the video icon below to see it. The picture to the left is the view from just across the street. Also below, note how you can win a month in Sedona. To see a second video which shows more of Sedona and the surrounding area—from Jerome to the south to the Grand Canyon to the north—go Here. Of course, when you’re in Sedona you ought to take day trips to the Grand Canyon, the Painted Desert, to Flagstaff and Prescott and Jerome, to Waputki and Walnut Creek Canyon, and to Meteor Crater. They’re close. 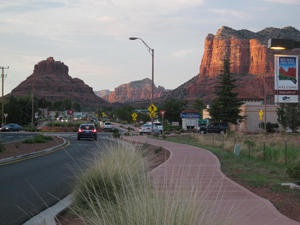 But even closer to the condo—five minutes away, if you drive slowly—is one of Sedona’s most iconic formations, Bell Rock, and next to it Court House Rock. The Chapel on the Rock isn’t much further. Or don’t get in the car at all. Across the street or just a few minutes walk away are a grocery store, lots of shops and art galleries, and great restaurants. …at the Guzman’s condo during the annual Emmanuel House/Bryan House SILENT AUCTION, usually held each November. Details coming Here in early October. Emmanuel House and Bryan House help uplift the working poor through education, community service, business development, and especially home ownership. Visit www.EmmanuelHouse.org for details, to get involved, and to donate. My website here serves to gather together all the major links, headlines, basic explanations, articles, videos, and the organization’s history. Please go to the Emmanuel House main page of this site to see all these. ♦ In 2016 Emmanuel House was named one of the “Top 100 social change organizations” in the world. Watch the video below and get in contact with us if you’re interested in renting or coming to the auction to bid. This entry was posted in Family, Music & Media Podcasts, Social Change and tagged Bell Rock, Chaperl on the Rock, Emmanuel House-Bryan House Silent Auction, Guzman condo, Oak Creek Estados, Sedona-Arizona. Bookmark the permalink.